Che cosa c'è di meglio che visitare la Ville lumiere tutta illuminata a festa? 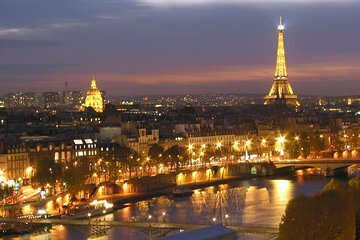 Goditi un tour a tema natalizio a Parigi per vedere questa incredibile città illuminata. Accoccolati sotto una coperta e sorseggia una bevanda calda mentre attraversi Parigi a bordo di un autobus scoperto a due piani. Questo tour di 1 ora e mezza ti porta davanti ad alcune delle attrazioni più famose, tra cui la Torre Eiffel, gli Champs Elysées e il museo del Louvre, tutte illuminate e sfolgoranti. È un modo davvero indimenticabile per visitare Parigi a Natale. Questa corsa in autobus aperta di 90 minuti include un drink caldo e un commento audio. Sali a bordo di un autobus scoperto a due piani vicino a Palais Garnier, teatro nazionale francese dell'opera, per un tour serale di 1 ora e mezza della Parigi in festa. Parigi è romantica e meravigliosa in qualsiasi momento dell'anno ma lo è ancora di più durante le feste, quando non solo i monumenti ma anche le strade sono illuminate. Al calar della notte e con lo sfarfallio delle luci natalizie, la città trasmette tutta la frizzante gioia del Natale. Accomodati sull'autobus e infilati sotto una coperta bella calda. Goditi una bevanda calda a base di caffè, tè o cioccolata e ascolta le informazioni dell'audioguida sulla storia e le attrazioni di Parigi mentre ci passi davanti. Ammira gli Champs Elysées, il museo del Louvre, il Palais Garnier e la Torre Eiffel tutta illuminata a festa. Non c'è modo migliore di trascorrere le feste nella Ville lumiere che prendere parte al tour delle luci di Natale di Parigi. Questo tour con autobus notturno rende le feste davvero indimenticabili. Dopo 1 ora e mezza in autobus, torni al punto di partenza nei pressi del Palais Garnier, dove termina il tour. Seeing the lights was magical. The blanket was a nice souvenir. Would recommend the tea as hot beverage. Kind of badly organized as it was chaotic figuring out which bus we were supposed to board, and we did not start the tour until 6:30pm, which could be a problem if you have dinner reservations. That said, it was worth it for the amazing photo ops of the lit up Eiffel Tower and other sights. Firstly, it was a nightmare trying to find our tour operator. I tried to contact a VIATOR operator telephonically but was not able to. Extremely disappointed and will not recommend or use VIATOR AGAIN!!! I have made several bookings with VIATOR and I am not happy with the service I have received. This was one of the best tours my family has taken. It completed a very busy day. The Paris Christmas lights were TERRIFIC and the tour outstanding. It would have been helpful to CLEARLY MARK the fact that we needed more than just our voucher. That it needed to be exchanged at the tour office for tickets. We waited in line for 30 minutes and then had to get out of the line, go back and wait in another 20 minute line to exchange the voucher for tickets and then get back in line. There was nothing to indicate that we had to exchange the voucher. As a matter of fact the voucher as it reads, seems to indicate nothing more was necessary. It wasn't the end of the world, but would have been great to know! Otherwise ... tour itself... magnificent! This tour was good in many ways, it took in a great part of the city, but should not be sold as a Christmas Lights Tour. Maybe, maybe the first 15 minutes were related to Christmas lights as far as the tour was concerned not the music which was all Christmas, not verbal commentary by the way. The balance of the tour was a traffic filled tour of the city I could have walked through with less time, especially since the weather was not that cold. Good trip, well planned but it was raining which unfortunatley spoilt sitting on the top of the bus, we were advised we could not change to another day which we suggest if it is raining consideration should be given to those who want to change their date. Very disappointing tour. Not many lights on show and I felt sorry for parents with kids on this tour. We left half an hour late too. Best part was being close to Eiffel Tower when the coloured lights came on. Can't recommend this tour.